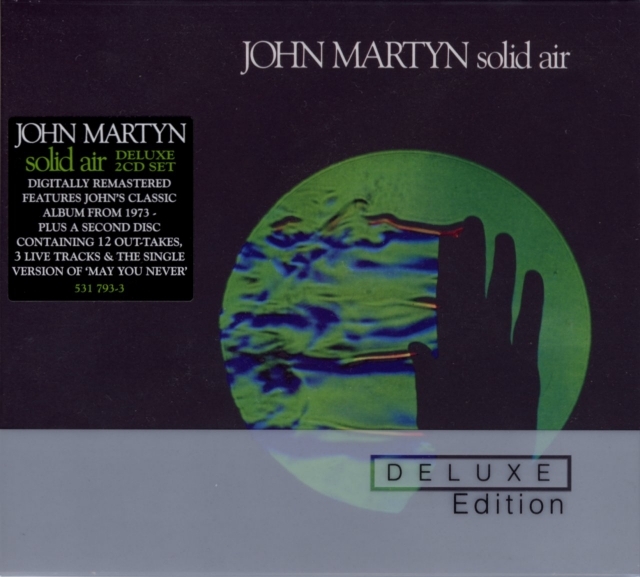 Compiled, with John Martyn's blessing, by John Hillarby from the official John Martyn website and with sleeve notes by Record Collector's Daryl Easlea, Martyn's landmark album from 1973 has now been digitally remastered and expanded into a two CD set. Disc One contains the original album, considered by many to be his best album, digitally remastered and sounding better than ever. Disc Two contains twelve previously unreleased out-takes, three live tracks and the 7" single version of May You Never. The plastic slipcase contains a cardboard foldout double CD sleeve. Inside are two CDs printed with the original Island pink rim logos. The lyrics of May You Never and Solid Air are printed next to the CDs. Also included is a 20 page booklet with liner notes by John Hillarby and Daryl Easlea, the lyrics and some photo material. CD package design: Phil Smee at Waldo's Design and Dream Emporium. Ian Barnett, Justin Brown, Hannah Chadwick, Daryl Easlea, Robin Ferris, David Hawkes, John Hillarby, Matthew "2Ts" Hillarby, Mick Houghton, Simon Li, Vicky Murray, Emine Rifat, John Talbot, Jon Turner and Teresa Walsh. 01 Solid Air (Alternative take) 5:48 Close to original. John: 'My poor hooter. Oh my poor hooter.' Recorded 7th Dec 1972 by John Wood and Howard Kilgour. 02 Over The Hill (Alternative take) 3:28 Recorded 7th Dec 1972 by John Wood and Howard Kilgour. 03 Don't Want To Know (Alternative take) 3:26 Recorded 9th Dec 1972 by John Wood and Rhett Davies. 04 I'd Rather Be The Devil (Alternative take) 7:39 More of a demotape, bit sparse. Recorded 7th Dec 1972 by John Wood and Howard Kilgour. 05 Go Down Easy (Alternative take) 4:55 Recorded 23rd July 1972 by John Wood. 06 Dreams By The Sea (Alternative take) 3:22 Recorded 3rd Dec 1972 by John Wood and Richard Reeve. 07 May You Never (Instrumental) 3:33 Recorded 30th Sept 1971 by John Burns and Phil Ault. 08 The Man In The Station (Instrumental) 5:32 Recorded 26th Nov 1972 by John Wood and Richard Reeve. 09 The Easy Blues/ Gentle Blues (Alternative take) 4:49 Recorded 9th Dec 1972 by John Wood and Rhett Davies. 10 Keep On 4:57 Recorded 13th Sept 1972. 11 When It's Dark 8:36 John Hillarby calls this track 'Never Say Never.' Recorded 20th Oct 1972 by John Wood and Rhett Davies. 12 In The Evening 4:04 Recorded 12th Feb 1972 by John Wood, Richard Reeve and Phil Ault. 13 May You Never (Single version) 2:43 Band version first released as single Nov 1971. 14 The Easy Blues (Live version) 3:24 Recorded at The Olympia, Paris 25th March 1974 by Brian Pickering and Brian Humphries on the Island Mobile Unit. Taken from the second show. Not all the lyrics have been included yet.